During World War Two Royal Air Force Balderton was a wartime RAF station which hosted among others No.408 (Goose) Squadron RCAF, the USAAF 437th and 439th Transport Carrier Groups, the Rolls-Royce jet engine trials unit and No.227 Squadron RAF. A new book is now available about the station in Nottinghamshire, which was located close to the Nottinghamshire/Lincolnshire county border. After several years of detailed research, Colin Savill BA (Hons) has written a new history of RAF Balderton. The book has just been published by the museum, which is located on part of the former RAF Winthorpe airfield site, itself just 5 miles from the former site of RAF Balderton. 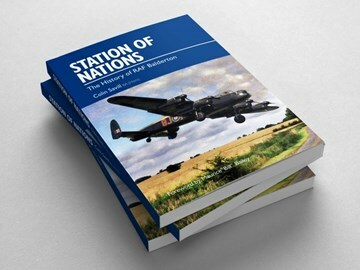 The book is entitled Station of Nations – The History of RAF Balderton and it is the story of the airfield from its beginnings to its demise as an RAF station. The book (ISBN 978-1-9996353-0-5) is in a softback format; 298 pages (paper weight: 130gsm); and includes over 200 images - black & white and colour photographs, maps, document copies and illustrations and includes a Foreword by former Flight Engineer Maurice ‘Bill’ Bailey who served at Balderton with No.227 Squadron. Copies of the book are now available to purchase from the Museum Shop and they cost £17.00 each. The book is also available via mail order from the Museum Shop at a cost of £20.50 per copy, 2nd class postage rate (Please telephone 01636 707170). Overseas mail order rates on application (please telephone +44 1636 707170). Anyone wishing to purchase a copy can visit the museum between 10am and 4pm daily and you do not need to pay a museum admission fee if you just wish to shop.